One of the oldest gardens in my yard is a tall bearded monochromatic blue iris bed. The word Monochromatic is defined as any shade, tint, or tone of one color. I've been putting blues together in this bed for many years. 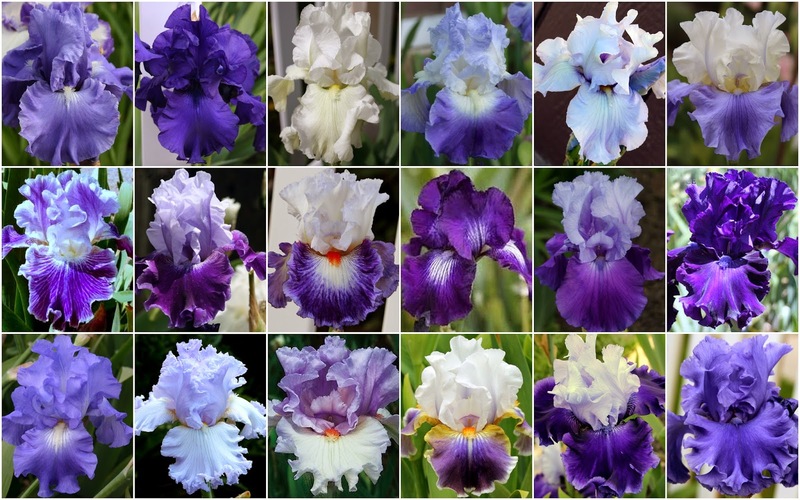 There are countless blue iris cultivars to choose from--ranging from the very light, silvery 'Silverado', to the blue-black of 'Hello Darkness', and every hue in between. I'm drawn to the calming and restful feeling that the cool blue color palette provides. As an added note, cool colors also help make small gardens appear larger because they tend to recede in the distance. Just be careful to plant them in full sunlight, as they can disappear in the shadows. To achieve a maximum focal impact, I've used a wide variety of selfs, plicatas, and neglectas*. Although many cultivars in the bed are older varieties, I have updated the bed through the years, adding new favorites. The 16' X 12' bed presently has 45 different cultivars. I added 3 new ones this year. 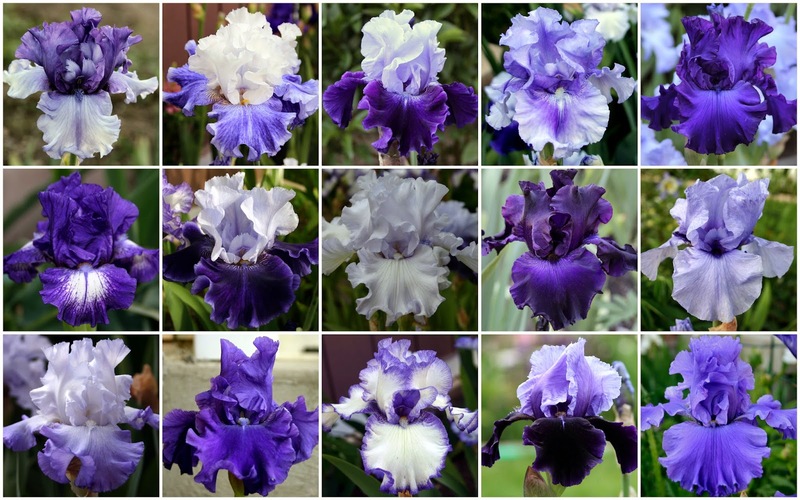 To help with the decision, I make a collage to see how well new irises coordinate with what I have. A pictorial 'wish list' folder on the computer helps to remind me of ones I want to add. This has been a valuable aid. I also make note of the cultivar's bloom season, extending the bloom time of the garden by using very-early to very-late blooming irises. Tint - when white is added to the color. Tone - when gray is added. Shade - when black is added. The bed incorporates all these in different Values. (The lightness or darkness of the color). Harmony in the bed was relatively easy to achieve with this single color scheme. By adding some whites, and accenting with companion plants in pinks and roses, this blue monochromatic iris bed has proven to be a favorite. Do you have a monochromatic garden? If so, I'd love to hear from you and what you've done. The Winter 2015 issue of the AIS Bulletin is now available for online viewing within the Emembers section of the AIS website. 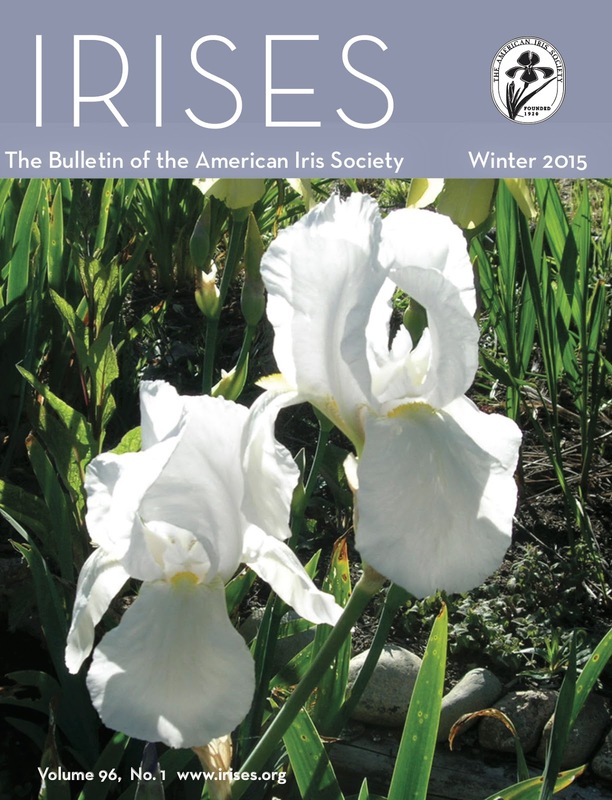 Welcome to the Winter 2015 edition of IRISES, the Bulletin of The American Iris Society. Hope you will enjoy several of the articles on this issue. 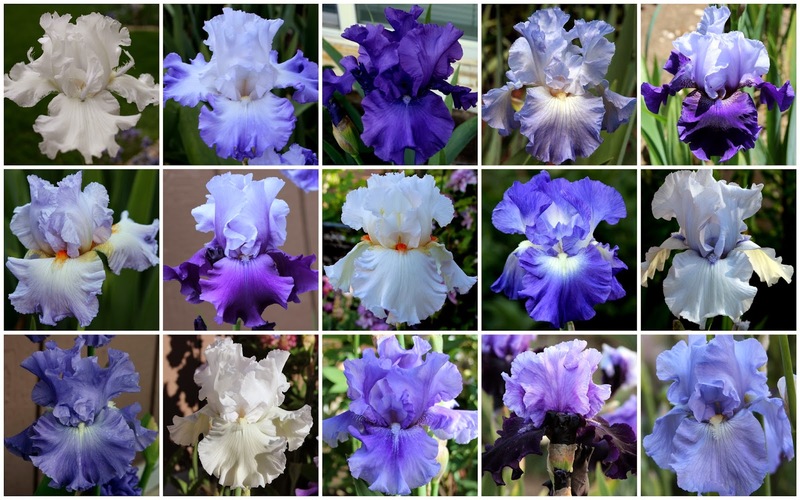 The always fascinating Symposium report lists irises chosen by popularity and reported by Riley Probst. The list always makes me think about what other iris lovers are enjoying around the country. Don't miss it. You will recognize the names of those in the 2014 Honorary Awards Recipients list, which includes the recipients for the Hybridizer Medal, the Distinguished Service Medal Award, the Gold Medal, and the Warburton Medal. A fascinating list of individuals, on page 9. Page 12 includes some important events throughout the AIS Sections world listed under Section Happenings. 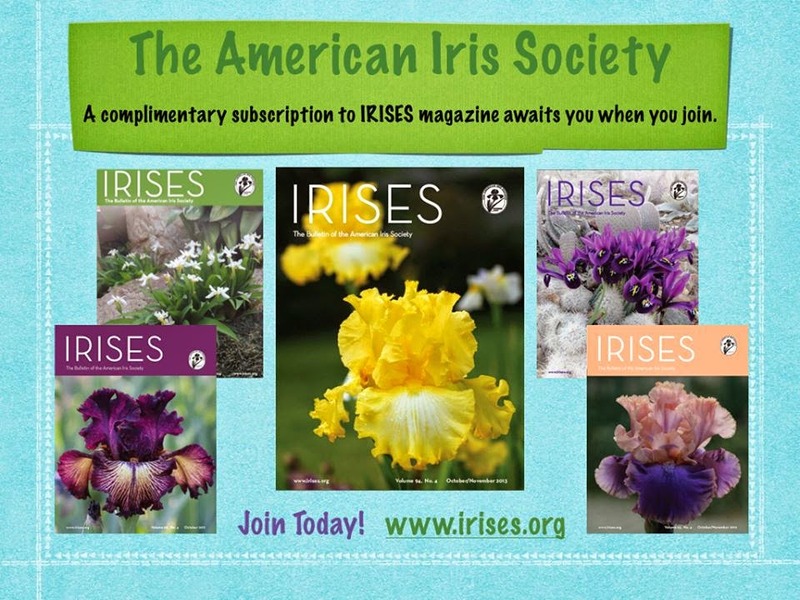 Find information about the Society for Louisiana Irises (SLI), Historic Iris Preservation Society (HIPS), the Spuria Iris Society, the Species Iris Group of North America (SIGNA), the Reblooming Iris Society, and the Society for Pacific Coast Native Irises (SPCNI). Enjoy the adventures and some fantastic shots by the AIS President Jim Morris' trip to Australia and New Zealand on page 14. On My Journey with Siberian Irises, hybridizer Zdenek Sidl from the Czech Republic reports about his experiences breeding these beauties, which grow naturally in his home country -- on page 16. Find on pages 29-31, everything you may want to know about the upcoming Spring Convention to be held in the Greater Portland, Oregon area May 18-23; and the Siberian/Species Convention following on May 24-25 on page 18. Hope you are as excited as I am about the 2020 AIS Centennial Celebration; I feel it's an incredible opportunity to expose the magnificence of our lovely irises, and the organization that helps disseminate its information to the rest of the world. You will find on page 25 what we're planning to do about a Centennial Iris, and a Centennial Logo. There's much more of interest in the Winter 2015 edition of IRISES, this short review was only to give you a hint of the lovely issue, and to let you know that the printed edition is now in the hands of the Post Office for those of you non-emembers. We hope that you will receive it soon. Come to the Iris Convention! With spring fast approaching, it is time to start making plans to attend the American Iris Society's spring 2015 Convention, "Iris in Wonderland." This year it is being held in beautiful Portland, Oregon, from May 18th to the 23rd. Iris friends old and new will be meeting up to tour gardens and see the very latest and greatest creations our hybridizers have to show off, as well as attending all the events, presentations and meetings for the various specialized societies. It is a wonderful time and we invite you to join us! I was so delighted to attend the 2006 Portland Convention, "Reigning Iris." It was my first Convention and everyone was so friendly and made me feel right at home. It was so much fun to meet iris friends that I had only known from the internet, and let me tell you, the gardens and flowers are amazing. Here are some photos I took at the gardens that will again be showcased. 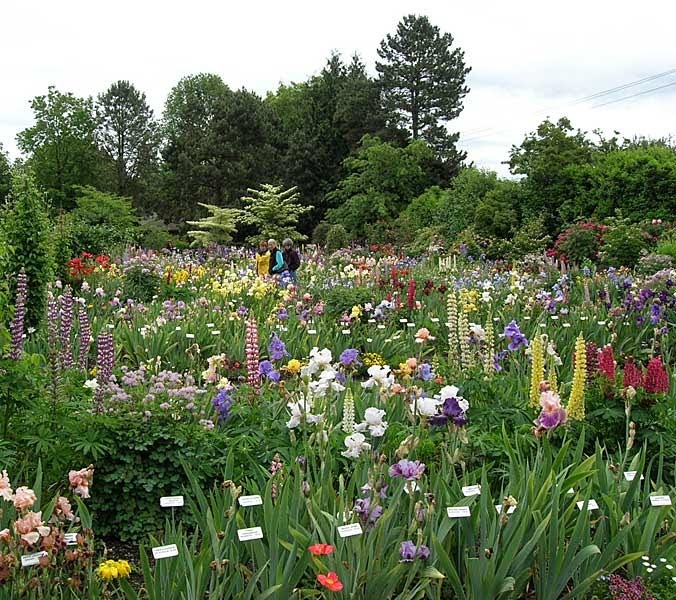 Aitken's Salmon Creek Garden, in Vancouver, WA: Spread over a lovely hillside, the rows and rows of flowers beckon visitors further and further into the distance. Terry and Barbara grow a wide variety of species and there is always something surprising to stumble upon. Mid-America Garden, in Brooks, OR, is the home of Paul Black and Thomas Johnson, two of America's top hybridizers. One of the highlights for me in this garden was seeing a preview of what's to come in their reselect seedling beds. 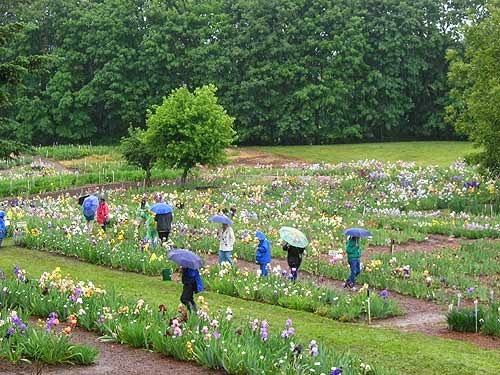 Schreiner's Iris Gardens in Salem, OR, is a destination for gardeners of all stripes. 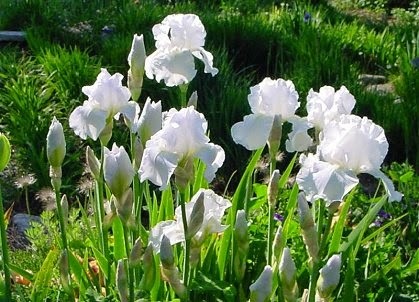 While irises are the main attraction, their display gardens are filled with companion plants and are always a delight. It is sure to inspire you with plenty of ideas to take home to your garden. And, again, seeing the rows and rows of reselected seedlings gives us a sneak peek into the future and the wonderful advances we'll see shaping iris fashion in years to come. We'll also be visiting Mt. Pleasant Iris Farm, in Washougal, WA, home of Chad Harris and Dale Grams; Miller's Manor Gardens, home of Lynn and Roger Miller; and Wildwood Gardens, home of Tracy and Will Plotner. After the main Convention, the Siberian & Species Convention will take place on the 24th and 25th. "Another Day in the Garden" will take visitors back to some of the previous gardens as well as the garden of Kevin Vaughn. 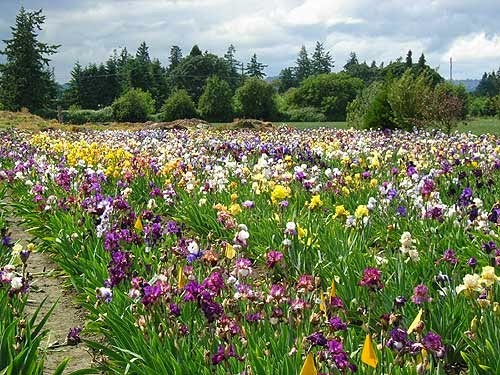 In addition to the cornucopia of irises you'll enjoy, the sights and attractions of Portland are nearby, and you have all the stunning natural beauty of the Pacific Northwest within easy driving distance. From the mountains of the Cascades and the rainforests of the Olympics, breathtaking drives through the Columbia Gorge, and the incredible geology from the deserts to the volcanoes to our beautiful beaches, there is something for everyone to enjoy. You can find all the details you'll need to plan your trip at the Convention's main website. See you there! If you hang around iris groups, either in the flesh-and-blood world of local societies and rhizome sales in your local neighborhoods, or in the virtual world like the Reblooming Iris page on Facebook, you know that a common question is "how can I tell if an iris is technically a rebloomer?" Sometimes irises bloom in the summer, sometimes in the fall, but not the following spring, and so on, hence the question. Some people are really fussy about their rebloomers and insist that they follow strict rules. For those, we have the definition from The World of Irises written by members of The American Iris Society, edited by Bee Warburton with Melba Hamblen as Assistant Editor, and with help from Dr. Raymond Smith. 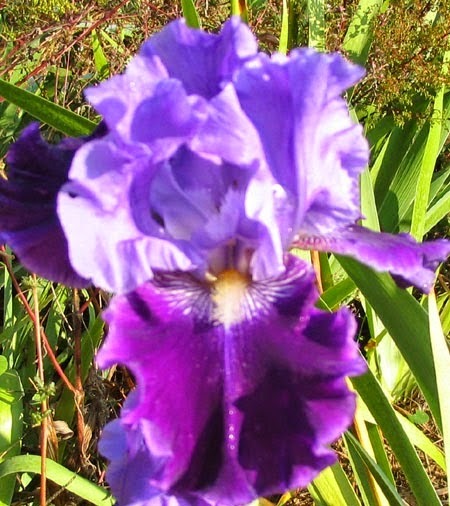 Dr. Smith wrote that "a rebloomer may be defined as any iris that produces an extra period of full bloom each year. By full bloom is meant bloom of one or more increases from each rhizome that flowered during the immediately preceding regular period. This definition excludes those sorts whose stalks emerge serially over an extended season, as well as clones with only a fraction of the mature rhizomes blooming during one period and the remainder during the next, even though such sorts do provide color apart from regular seasons and are frequently mislabeled rebloomers" (Warburton: 137). The AIS Judges Handbook is a bit more "loose." In summary, it states that rebloom should produce enough additional bloomstalks to double the total number of days of bloom produced annually (143). 1. Rebloomers (Cyclic Rebloomers), the standard for this group, are cultivars which complete two distinct cycles of bloom. After the spring flowering, there is a second nearly predictable period of bloom. 2. 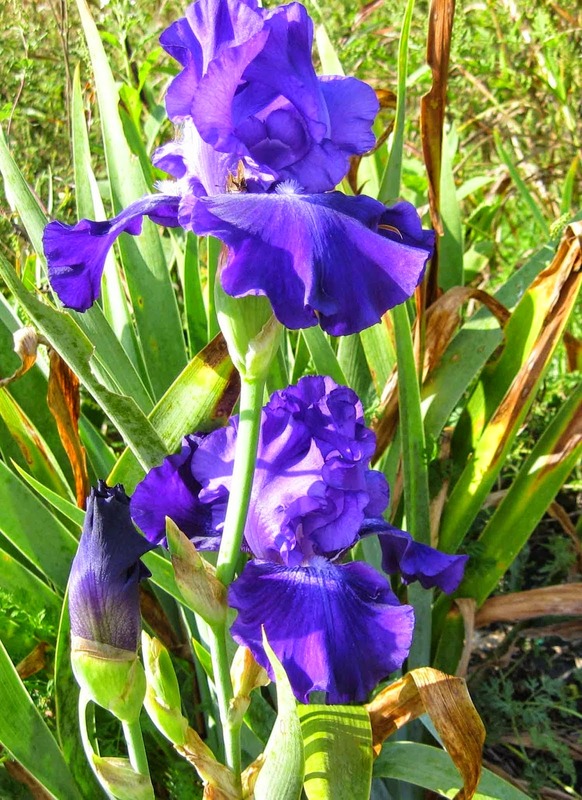 Multiple Blooming Irises send up bloomstalks repeatedly at any time throughout the growing season, spring to summer and fall. 3. Repeaters produce additional bloomstalks with unpredictable regularity immediately following or shortly thereafter the initial Spring bloom season. It is not uncommon for these varieties to extend the spring bloom season from four to eight weeks. 4. Sporadic Rebloomers are varieties which unpredictably produce bloomstalks at varying times during the growing season. 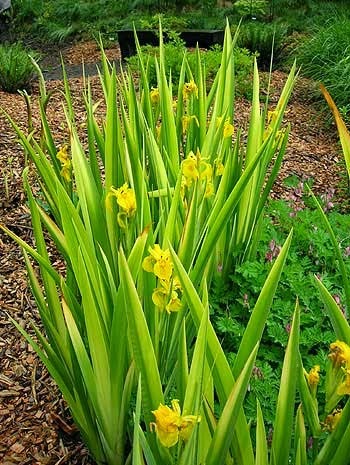 Many occasional rebloomers perform well on the West coast and the Southern areas of the United States. While they are highly regarded there, they may not show reblooming tendencies in colder climates. 5. Secondary Stalk Rebloomers, although rare, occur when rhizomes send up secondary stalks in the same growing season. I must admit, I have a loose definition: I like iris blooms so much that I welcome just about anything that puts up an extra bloom stalk. My hybridizing lines were originally started with 'Feed Back', 'Immortality', 'Early of Essex' and a few others that rebloomed in fall. After about 20 years I decided to work for summer bloom, and to stop working with most of the fall cycle rebloomers, since the fall bloomers often freeze here. If you have any subjects or questions on rebloomers you would like to see addressed, please email me at bridgeintime@aol.com.